The Blonde - so then...into Idaho Falls, a quick stop to shop for batteries as our remotes for the lift on the camper are needing to be replaced. All good...newly installed batteries and we are ready to rock again...and then we see... the Museum of Idaho with its Steampunk Expo. Interesting....we're going in! It’s a rather weird concept and takes quite a bit of explaining. "steam·punk, noun - a genre of science fiction that has a historical setting and typically features steam-powered machinery rather than advanced technology". Even Wikipedia has a job of describing it simply!! “Steampunk Reimagineer” Bruce Rosenbaum - responsible for the collection. The term itself comes from science fiction novels. It was allegedly coined by author Kevin Jeter as a way of distinguishing him and fellow retro-tech sci-fi writers from future-loving “cyberpunks” like William Gibson. But it’s grown into a whole visual style, and even a philosophy. It’s all about mixing old and new: "fusing the usability of modern technology with the design aesthetic and philosophy of the Victorian age". So here’s my take on it. Hah!! H.G. Wells...sometimes described as "The Father of Steampunk"
Steampunk is historical science fiction. You take the period of the past, generally accepted as the Victorian era, spanning up to the Industrial Revolution (though some people will debate taking it that far), and you add a lot of technology that did not actually exist at the time. Because much of the period predates electricity, steam is commonly used in its place. The technology can be things that did not exist until much later, or it can be something that has never existed at all. Got it?! Steampunk is therefore the "baby of innovation". It started with people long ago imagining amazing things that could exist with technology; people like Jules Verne and H. G. Wells. Now it exists with people imagining their lives as they would have been in the past, inventing new and exciting tools and ideas. Steampunk is born from people who love to invent and have a desire to explore what technology can do for us. The ​Red Fork Empire ​is a group of people who make art for the love and dedication for all that is steampunk. A lot of what is created in the name of steampunk is art. People invent machines and create sculptures out of old machines parts, and others take pleasure in reworking the fashions of the day in to something modern and yet still historically accurate. Still confusing??? But let’s take a stroll through the expo which is full of colours, mystique, artistic expression, creative fabrication and a thread that joins infamous inventors and visionaries together. (My words there - I’m getting the hang of the flowery writing!). And I couldn’t leave out the most amazing pair of shoes in the exhibit! So there you go...Steampunk...definitely "Strange & Quirky"....I love it! Maybe not so strange but definitely quirky is the story of Evel Knievel.... we were heading to Twin Falls on the Shoshone River and whilst hiking our way around to get photographs of the falls on the rim walk track, we came across Evel Knievel’s famous stunt spot about 2 miles along the canyon rim walkway. Here in 1974, he attempted to jump over the Snake River on a rocket-powered motorcycle, the Skycycle X-2. I climbed the launch ramp in strong winds and looked at that huge expanse of the canyon and decided he must have been certifiably mad. I had to know more about this man and couldn’t believe that there was so much to tell! It’s an amazing story and I loved that we just happened on this famous site. It stirred A LOT of research and deserves this "Strange & Quirky" entry. 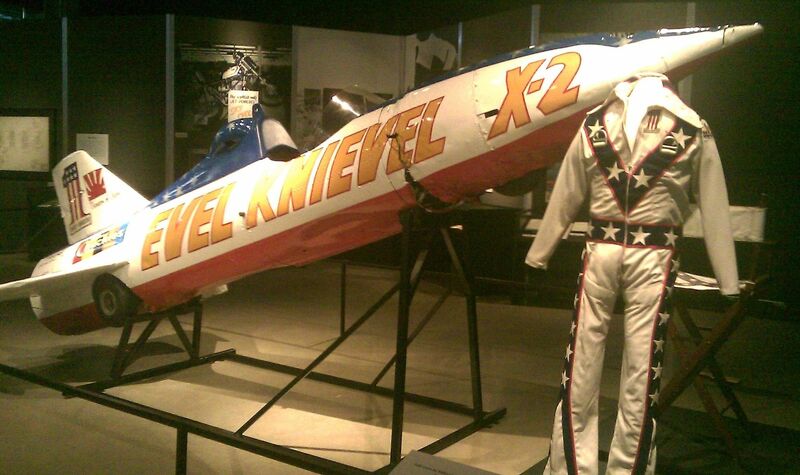 The X-2 rocket and suit warn for the attempt now at the Evel Knievel Museum. For the crazy stunt over the Snake River, Knievel invested $1 million, leased land on both sides of the Snake River and built a large earthen ramp and launch structure at the south rim of the canyon for his equipment and rocket... On Sunday, September 8, 1974, at 3:36 p.m the steam that powered the engine of the the Skycycle X-2 was superheated to a temperature of 500°F (260 °C), and a crowd of 35,000 gathered to watch Knievel's jump, which sadly failed because his parachute opened too early, causing him to float down towards the river. Knievel likely would have drowned were it not for canyon winds that blew him to the river bank; he ultimately survived with just a broken nose! One of his less painful falls from grace.....! Evel ready for take off!! The Snake River Canyon that he fired himself over. OH MY GOSH!!! Evel Knievel - "The Man" - How did this daredevil get started? Well, in one of his earlier jobs he was a driver of a large earthmover at a copper mine but was fired when he made the earthmover do a motorcycle-type wheelie and drove it into Butte's main power line, leaving the city without electricity for several hours. Then, using the hunting and fishing skills taught to him by his grandfather, Knievel started the Sur-Kill Guide Service. He guaranteed that if a hunter employed his service and paid his fee, he would get the big game animal desired or Knievel would refund his money. Business was very good until game wardens realized that Knievel was taking his clients into Yellowstone National Park to find prey! He tried a number of other jobs to support his family and was quite successful as an insurance salesman. Then he opened a Honda motorcycle dealership and promoted motocross racing but Honda couldn’t compete with the cheaper Japanese imports and the dealership had to close. Then he learned how to do a “wheelie” and ride while standing on the seat of his then bike and remembering a tv show starring a daredevil Joie Chitwood, he felt he could do something similar as a daredevil stuntman. Knievel rented a venue, wrote the press releases, set up the show, sold the tickets and served as his own master of ceremonies. After enticing the small crowd with a few wheelies, he proceeded to jump a twenty-foot-long box of rattlesnakes and two mountain lions. Despite landing short and having his back wheel hit the box containing the rattlesnakes, Knievel managed to land safely. Knievel realized that to make any amount of real money he would need to hire more performers, stunt coordinators and other personnel so that he could concentrate on the jumps. Knievel and his daredevils debuted on January 3, 1966, at the National Date Festival in Indio, California. The show was a huge success. During the next performance, Knievel attempted a new stunt in which he would jump, spread-eagled, over a speeding motorcycle. Knievel jumped too late and the motorcycle hit him in the groin, tossing him fifteen feet into the air. He was hospitalized as a result of his injuries. The show broke up after that due to his injuries but after recovering Knievel started a small solo act travelling from small town to small town outdoing other stunt people who were jumping animals or pools of water he started adding cars. He worked without injury for 5 months but on June 19 in Missoula, Montana, he attempted to jump twelve cars and a cargo van. The distance he had for takeoff did not allow him to get up enough speed. His back wheel hit the top of the van while his front wheel hit the top of the landing ramp. Knievel ended up with a severely broken arm and several broken ribs but the crash and subsequent stay in the hospital were a publicity windfall. He recovered, repeated the jump adding another car each time, eventually jumping 16 cars. A repeat of this left him with more serious injuries. In 1968 as a guest on a late night talk show he got national attention which brought both a larger paycheck and larger fanbase. He decided to jump the fountains at Caesars Palace in Las Vegas and have it filmed at his own expense. After doing the normal pre- jump show and a few warm up approaches, Knievel began his real approach. When he hit the takeoff ramp, he claimed he felt the motorcycle unexpectedly decelerate. The sudden loss of power on the takeoff caused Knievel to come up short and land on the safety ramp which was supported by a van. This caused the handlebars to be ripped out of his hands as he tumbled over them onto the pavement where he skidded into the Dunes parking lot resulting in a crushed pelvis and femur, fractures to his hip, wrist, and both ankles, and a concussion that kept him in the hospital. Rumors circulated that he was in a coma for 29 days in the hospital. 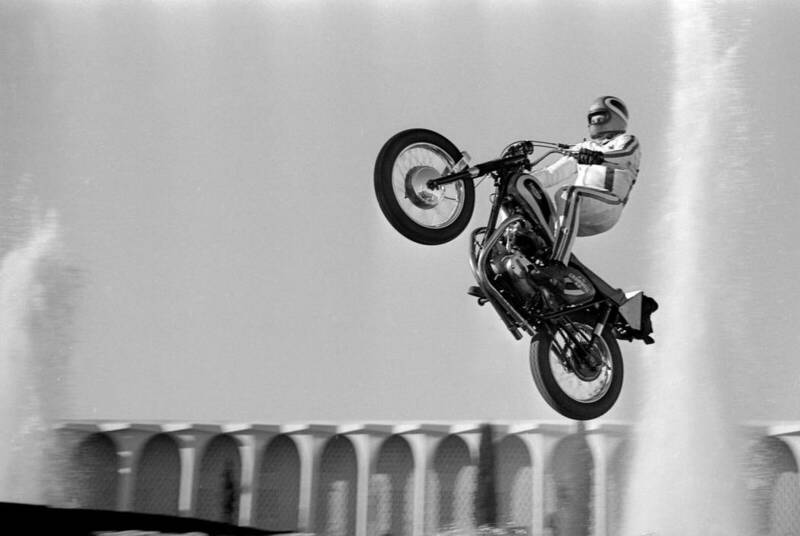 The Caesars Palace crash was Knievel's longest attempted motorcycle jump at 141 feet. After his crash and recovery, Knievel was more famous than ever. ABC-TV bought the rights to the film of the jump, paying far more than it originally would have done had it televised the jump live. To keep his name in the news, Knievel proposed his biggest stunt ever, a motorcycle jump across the Grand Canyon...but met stern resistance from the Parks Department. Just five months after his near-fatal crash in Las Vegas, Knievel performed another jump. On May 25, 1968, in Scottsdale, Arizona, Knievel crashed while attempting to jump fifteen Ford Mustangs. Knievel ended up breaking his right leg and foot as a result of the crash. Jumping on the Las Vegas Strip...1968. By 1971, Knievel realized that the U.S. government would never allow him to jump the Grand Canyon. To keep his fans interested, Knievel considered several other stunts that might match the publicity that would have been generated by jumping the canyon. Ideas included jumping across the Mississippi River, jumping from one skyscraper to another in New York City, and jumping over 13 cars inside the Houston Astrodome. While flying back to Butte from a performance tour, Knievel looked out the window and saw the Snake River Canyon. After finding a location just east of Twin Falls, Idaho, that was wide enough, deep enough, and on private property, Knievel leased 300 acres for $35,000 to stage his jump. He set the date for Labor Day (September 4), 1972. In January 7 and 8, 1971, Knievel set the record by selling over 100,000 tickets to back-to-back performances at the Houston Astrodome. On February 28, he set a new world record by jumping 19 cars with his Harley-Davidson XR-750 at the Ontario Motor Speedway in Ontario, California. The 19-car jump was filmed for the movie Evel Knievel. Knievel held the record for 27 years until Bubba Blackwell jumped 20 cars in 1998 with an XR-750. In 2015 Doug Danger surpassed that number with 22 cars, accomplishing this feat on Evel Knievel's actual vintage 1972 Harley-Davidson XR-750. On March 3, 1972, at the Cow Palace in Daly City, California, after making a successful jump, he tried to come to a quick stop because of a short landing area. Knievel reportedly suffered a broken back and a concussion after getting thrown off and run over by his motorcycle, a Harley-Davidson. Knievel returned to jumping in November 1973, where he successfully jumped over 50 stacked cars at the Los Angeles Memorial Coliseum. The "Bus Jump" at Wembley Stadium, London, May, 1975. Although Knievel never attempted to jump the Grand Canyon, rumors of the Canyon jump were started by Knievel himself in 1968, following the Caesars Palace crash. Knievel switched his attention in 1971 to the Snake River Canyon in southern Idaho. On May 26, 1975, in front of 90,000 people at Wembley Stadium in London, Knievel crashed while trying to land a jump over 13 redundant single-deck AEC Merlin buses (the term "London Buses" used in earlier publicity had led to the belief that the attempt was to be made over the higher and more traditional AEC Routemaster double-decker type). After the crash, despite breaking his pelvis, Knievel addressed the audience and announced his retirement by stating, "Ladies and gentlemen of this wonderful country, I've got to tell you that you are the last people in the world who will ever see me jump. Because I will never, ever, ever jump again. I'm through." Near shock and not yielding to Frank Gifford's (of ABC's Wide World of Sports) plea to use a stretcher, Knievel walked off the Wembley pitch stating, "I came in walking, I went out walking!" A true bone breaker! During his career Knievel suffered more than 433 bone fractures, earning an entry in the Guinness Book of World Records as the survivor of "most bones broken in a lifetime"....not sure too many people would aspire to that record!!! On October 25, 1975, Knievel successfully jumped 14 Greyhound buses at Kings Island near Cincinnati, Ohio. He held the record for jumping the most buses on a Harley-Davidson for 24 years (until broken by Bubba Blackwell in late 1999). The Kings Island event scored the highest viewer ratings in the history of ABC's, "Wide World of Sports", and would serve as Knievel's longest successful jump at 133 feet (although the Caesars Palace jump was longer, it ended in a crash). In the end, Knievel was featured in 7 of the ten highest rated episodes of ABC's Wide World of Sports. After the Kings Island jump, Knievel again announced his retirement. But as usual he could not settle and Knievel continued to jump. However, after the lengthy Kings Island jump, Knievel limited the remainder of his career jumps to shorter and more attainable lengths. 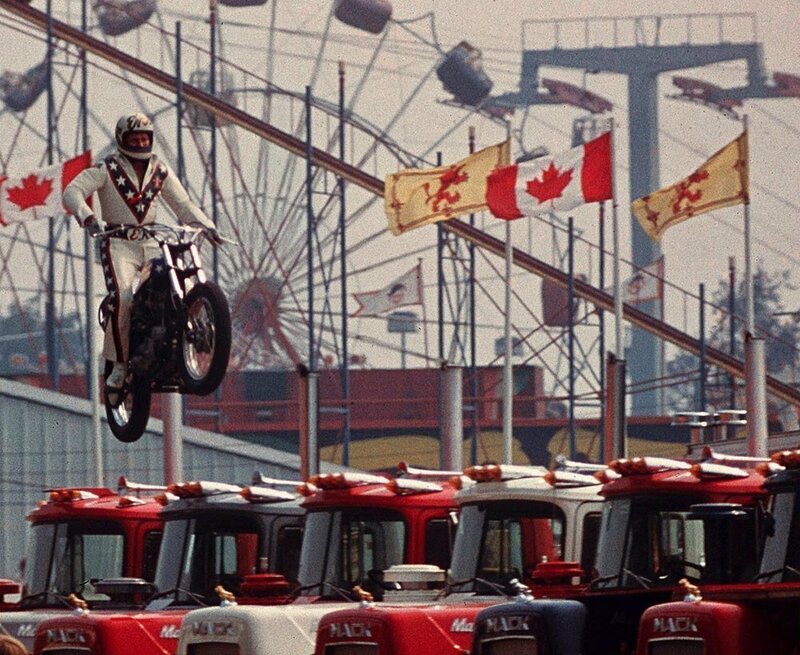 Knievel jumped on October 31, 1976, at the Seattle Kingdome. He jumped only seven Greyhound buses but it was a success. Despite the crowd's pleasure, Knievel felt that it was not his best jump, and duly apologized to the crowd. On January 31, 1977, Knievel was scheduled for a major jump in Chicago, Illinois. The jump was inspired by the film Jaws. Knievel was scheduled to jump a tank full of live sharks and would be televised live nationally. However, during his rehearsal, Knievel lost control of the motorcycle and crashed into a cameraman. Although Knievel broke his arms, he was more distraught over what he claimed was a permanent eye injury to cameraman Thomas Geren. The cameraman was admitted to the hospital and received treatment for an injury near his eye, but received no permanent injury. The footage of this crash was so upsetting to Knievel that he did not show the clip for 19 years until the documentary Absolute Evel: The Evel Knievel Story. Afterwards, Knievel retired from major performances and limited his appearances to smaller venues to help launch the career of his son, Robbie Knievel. 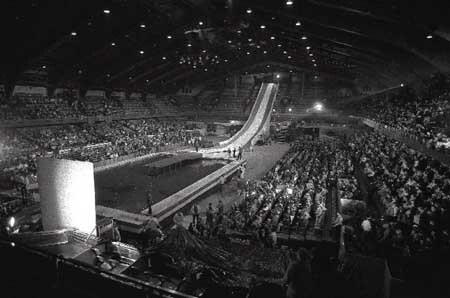 His last stunt show, not including a jump, took place in March 1980 in Puerto Rico. However, Knievel would officially finish his career as a touring "companion" of his son, Robbie, limiting his performances to speaking only, rather than stunt riding. His last appearance with his son Robbie (on tour) was in March 1981 in Hollywood, Florida. 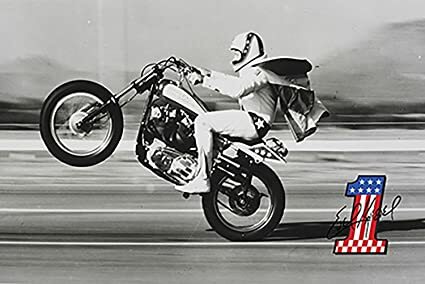 For 35 years, Knievel held the record for successfully jumping the most stacked cars on a Harley-Davidson XR-750 (the record was broken in October 2008). His historic XR-750 is now part of the collection of the Smithsonian's National Museum of American History. Made of steel, aluminum and fiberglass, the customized motorcycle weighs about 300 pounds. He died of pulmonary disease in Clearwater, Florida, in 2007, aged 69.